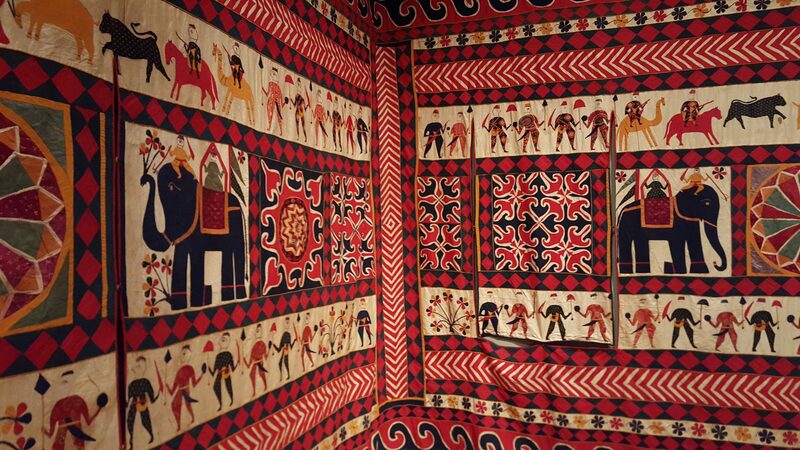 The Fabric of India is my kind of an exhibition. History, fabric and art. Sometimes when you really, really look forward to something, the reality can prove to be a bit disappointing. Not so this time. From the moment you walk in and are greeted by an enormous seventeenth century Mughal floor covering acting as a background to a pair of stunningly modern saris, you know that you are in for a treat. Raw materials and techniques kick off the exhibition. India has it all: vast cotton fields, thousands of silk moths and bales of yak wool; add to that golden thread, iridescent beetle wings and an incredibly skilled workforce and you have all the ingredients you need for a world beating fabric industry. My own favourite from this section deployed those beetles – sewn onto a strip of muslin they make a glittering, beautiful border: I long to make myself a gown trimmed with deep flounces of it. Once upon a time a man was strolling along a New York street and noticed a heap of fabulous fabric thrown out on the pavement. Seventeen metres long and a couple high it was too much for him to carry so he arranged for a clutch of friends and a van to collect the cloth. Jerome Burns is an art appraiser and recognised the wall hanging as an important piece of work so offered it to the Victoria and Albert Museum. Rosemary Crill was the lady from the V&A who accepted the cloth and now she is co-curator of this exhibition. If I owned such a wall hanging, it would fit nicely in our playroom, but then I wouldn’t be so careless as to chuck it out. 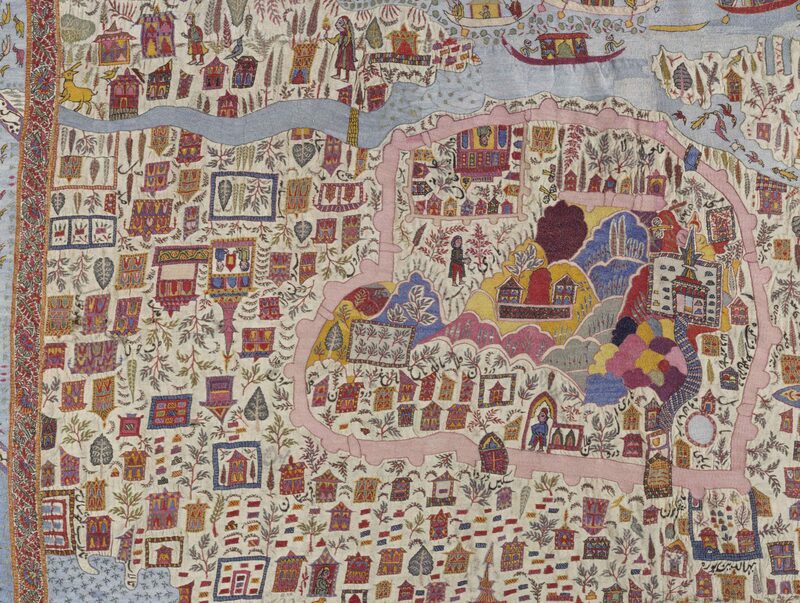 Museums, reading and sewing are my top three things but a very close fourth is maps. So a fine Kashmir shawl with a map woven into it was always going to be a winner with me. It was given to Queen Victoria and I like to think of her sitting in Osbourne House swathed in the shawl whilst examining the map of Srinagar. Sadly it was never worn. Life in Cultural Wednesday Towers would be very different if I could spend my days sat in a room adorned with applique elephants, wrapped in a map pashmina and reading books. 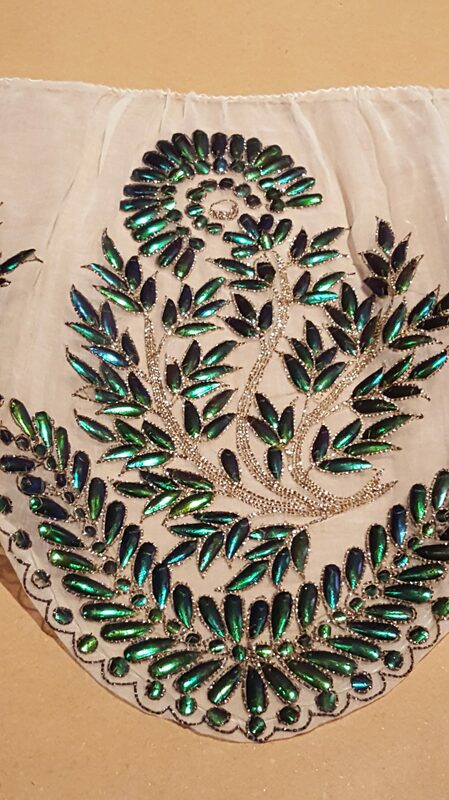 The Fabric of India doesn’t merely showcase fabulous fabric, it tells its story from the means of production, via the politics of production, right up to the very latest fashions from India’s designers. As ever the V&A shop is full of tempting merchandise. This time there is a fabulous array of scarfs, all of them are made by the very best craftspeople and have price tags to match. Mr CW need look no further for Christmas ideas. This looks my sort of thing. I had such a wonderful positive experience in India. It looks facsinating. So pleased it lived up to your expectations.